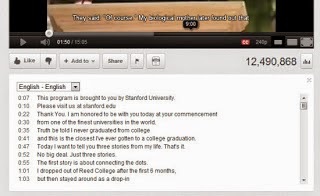 Transcripts and captions are a way to enhance the video-viewing experience for users. They supplement the audio to help viewers better understand what's being said. Similar to subtitles in a movie, you can add captions to a your YouTube videos which are not only played with the video, but can also be shown separately and made clickable. In this post, we'll talk about captioning your YouTube videos. Captioning makes it easier for people to understand what's being said. This can be especially helpful for those with a hearing disability. But it doesn't just serve accessibility purposes. Non-native language speakers have a harder time understanding spoken words, and written text can increase comprehension. Besides, captions make video text searchable by search engines, so you can increase your chances of getting found in search results. How to caption a video? You should have your captions ready before moving on. Log into your account on YouTube, and click on your username on the top-right corner of your screen. Then click on Video Manager to manage your uploads.